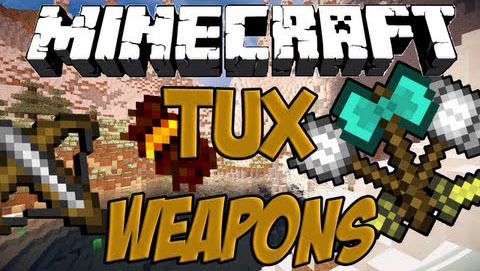 TuxWeapons adds many new and awesome weapons to the game Minecraft. Each weapon supports a different and unique fighting style and can be combined for a truly unique experience. 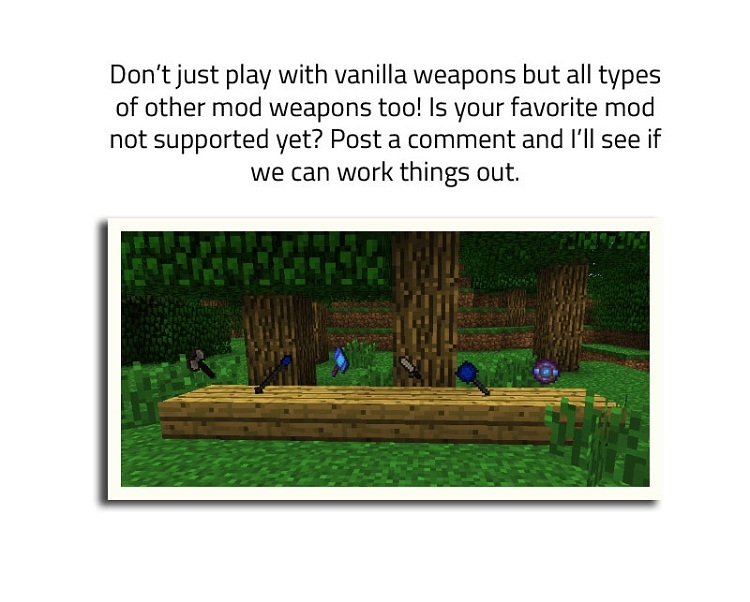 Not only that, but TuxWeapons is the first and only weapons mod to come with complete support for some of your other favorite mods. Now for the first time you can get a unique and amazing fighting experience no matter what mods you have installed. All explosions are toggleable in the config, and the config also has an option for you to disable any weapons you do not like. 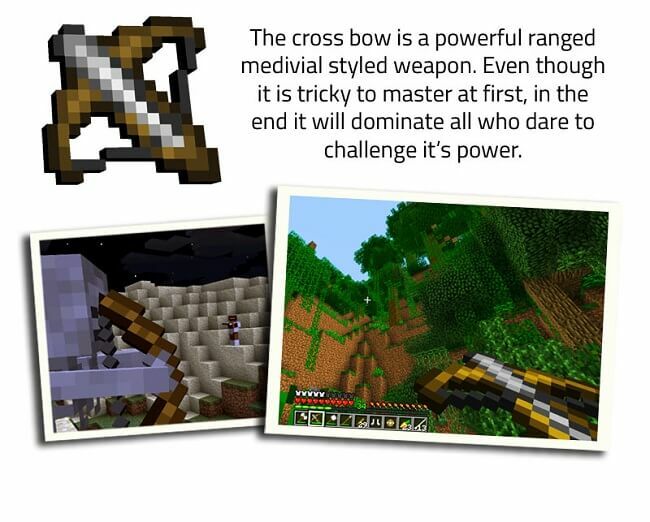 The cross bow has its advantages and disadvantages, for one it has a different loading process. To load the cross bow simply left click the bolt first and if there is a cross bow in your hotbar it will become loaded, simply go to it charge and shoot like a normal bow. To reload right click on the bolt again. The cross bow has deadly accuracy and does high damage, however when you shoot a bolt it becomes damaged forever and you can not pick it back up. 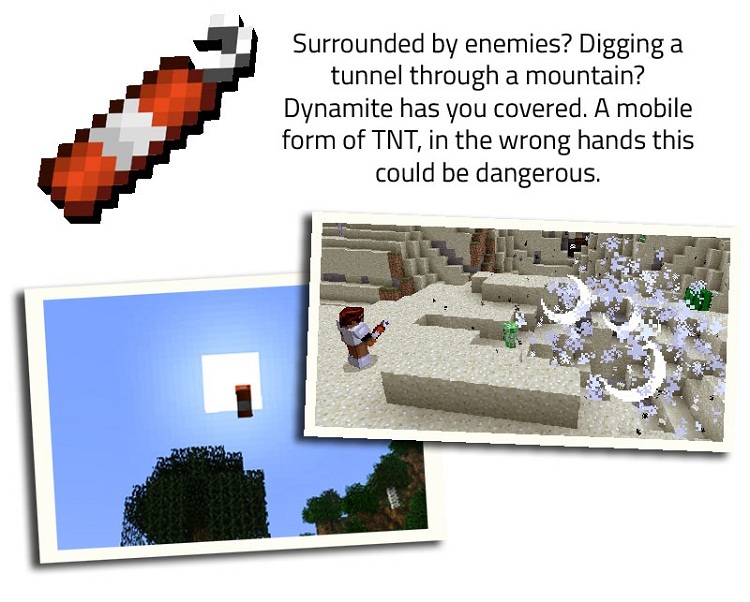 Dynamite is a less powerful throwable form of TNT and if you throw it on the ground beneath your feet and time it right you can do an awesome rocket jump. The Fire Charge Cannon is the pyromaniac’s best friend. 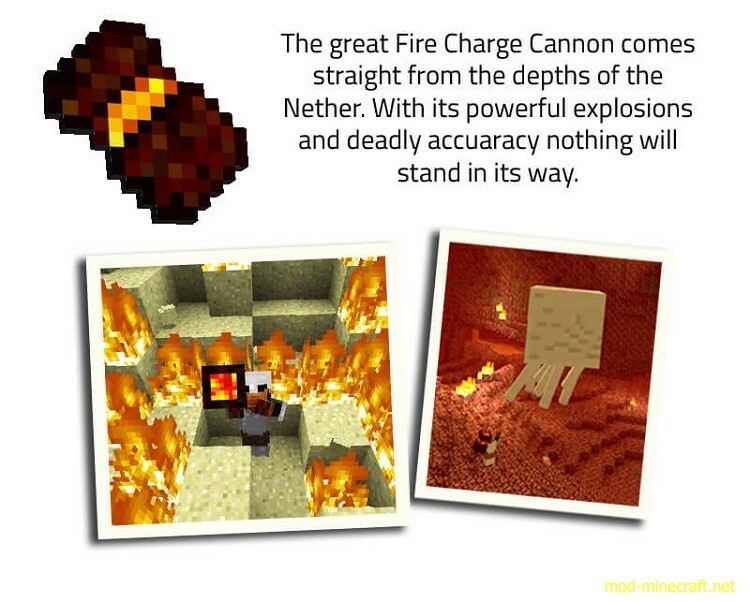 It shoots explosive fire charges incredibly accurately and if charged long enough will explode with fire. Of course all explosions and fire can be disabled if you’d like. This monster of a weapon uses fire charges as ammo which you can craft using the vanilla crafting recipe. As you hold the cannon it slows you down because it is so heavy. In order to craft the cannon you will need to get the magma core, the magma core is a new drop added to magma cubes in the nether, there is a 5% drop chance but you can increase that if you’d like in the config. For the following recipes diamonds can be substituted for any item that can make the weapons (e.g. 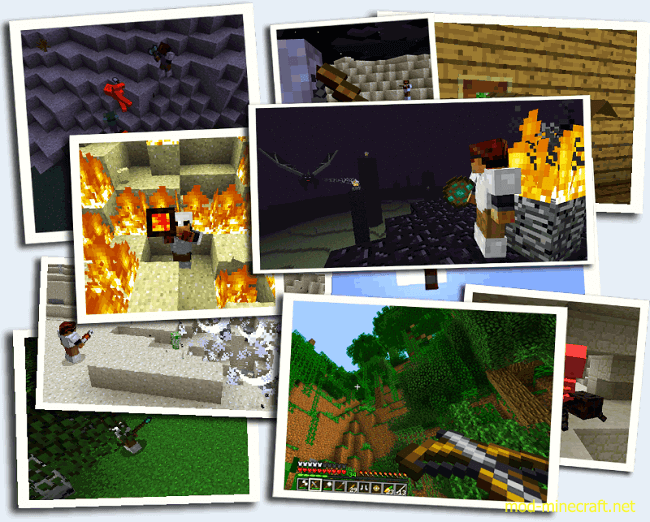 wood, cobble, iron, etc). This weapon does a lot of damage, but does not have a very high durability. It can also cut down trees fairly quickly. 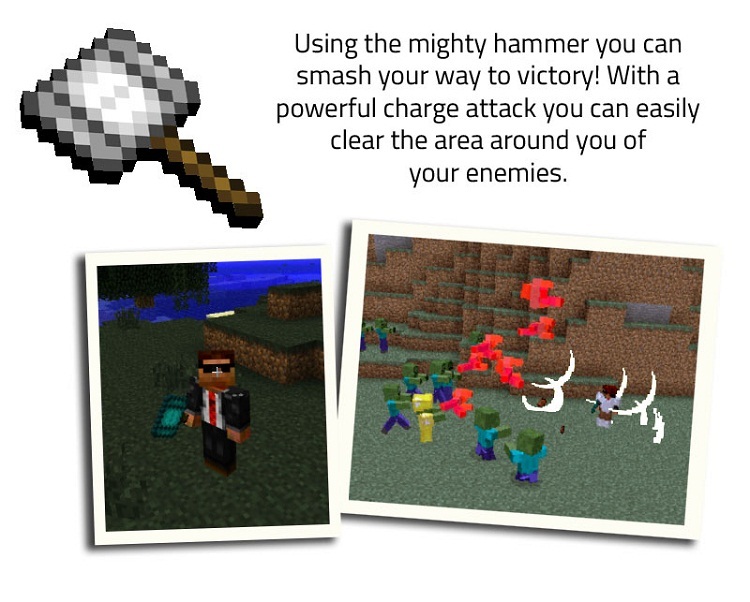 The hammer has a mighty charge smash attack, hold the right click button to charge it and release to clear the area around you of mobs. It does the same amount of damage as the sword, but has a slightly lower durability. However it will last longer than the battle axe. 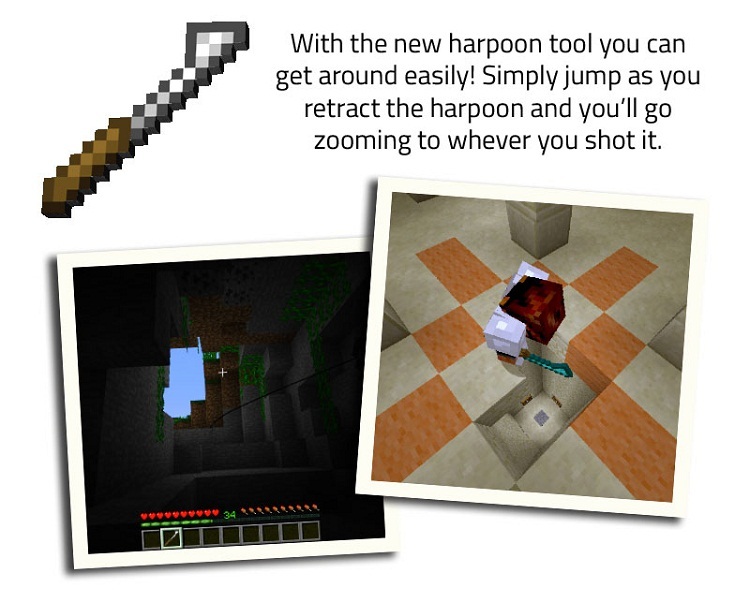 The harpoon is actually classified as a tool because it does not do any damage. 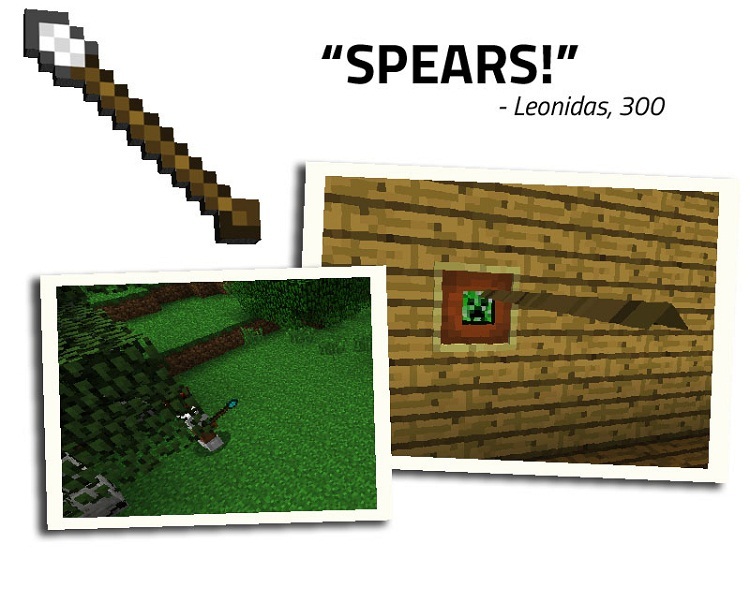 It works like a fishing rod and a grappling hook combined. Simply throw out the harpoon and jump as you call it back and you’ll go zipping to wherever you shot it. However it has a very low durability. The knives do a fair amount of damage when thrown, they will not do damage if you try and use them as a sword however. If a knife hits its target it becomes damaged and cannot be picked back up. The knives can stack so it makes it easy to stock up on knives. 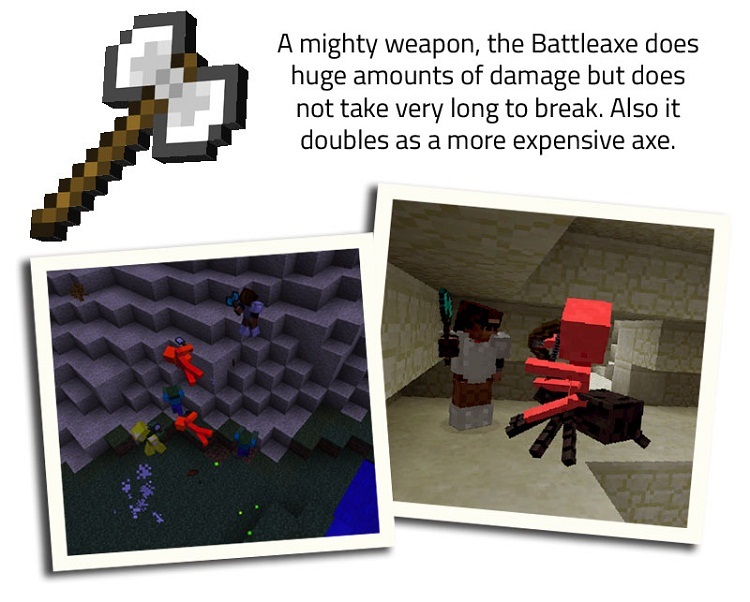 The mace does random amounts of damage on each hit, its lowest damage is worse than a sword and its highest damage is better than a battle axe. It has a medium durability. The shield is also a tool. It has low durability but when right clicked can block most damage. Also sorry, but dual wield is not supported… yet. In melee the spear does less damage than the sword but when you throw it does about the same. Simply right click and charge to throw it and then you can run and pick it back up. A useful weapon in any situation. If the crafting recipes conflict with any other mod there is an option in the config for alternate crafting recipes which will basically turn all of the crafting recipes on their sides. Also, make sure to check out the config anyway! There is a couple of cool easter eggs in there. 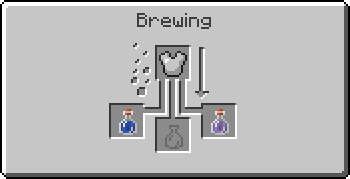 Brewing potions is more difficult to do and to explain. I have tried to create easy recipes for you to understand. If you have any questions do ask in the comments.To brew any potion you must have an awkward potion first. The awkward potion looks exactly like a water bottle, that’s a vanilla thing. To brew an awkward potion simply put in one nether wart with the desired number of water bottles like so. 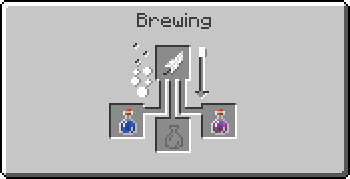 For the following potions the potion on the left is the input potion which is always an awkward potion and on the right is the potion output. 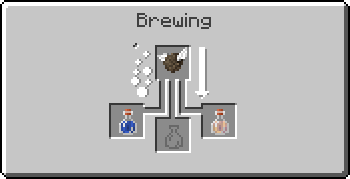 The potion of flight allows you to fly in survival mode! This potion effect will not work in creative mode, you must be in survival. 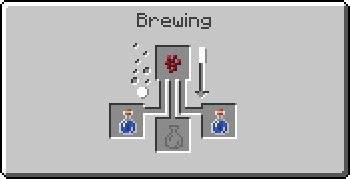 To use the potion simply press and hold your jump key and you will accelerate upward. This can also slow down your fall if you are about to die. The potion of flight will not cancel all fall damage, but if you slow yourself down before landing you won’t get hurt. Whenever you’re flying make sure to watch how much time you have left! 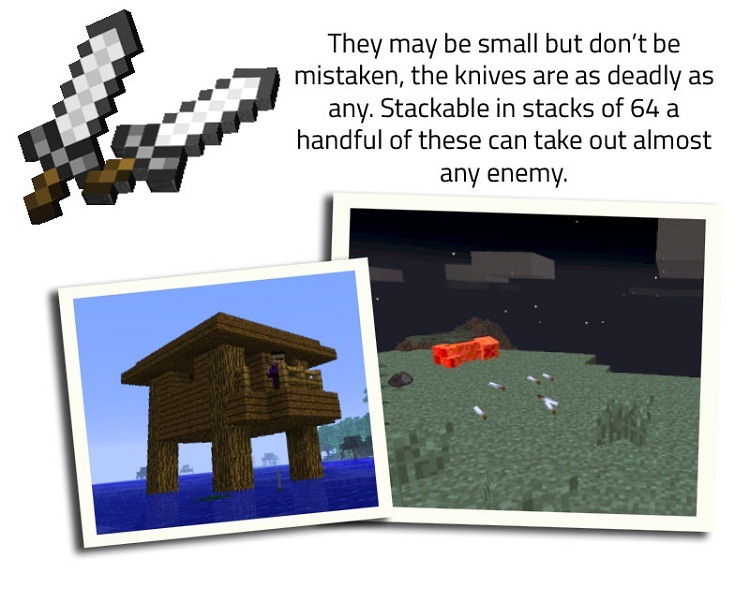 You don’t want to find yourself way above the ground with no way to stop your fall!Also try throwing this on any mob you encounter and watch them soar!The weird doohicky used in the recipe is the catalyst of flight and it is a rare drop from Endermen, chickens, and Ghasts. The potion of convenience is simply a time saver. It allows you to auto hop up one block tall jumps, similar to what a horse does. This potion is great if your going on a long journey and would like to save a few hunger points. The potion of heat will burn any evil mobs in a 4 block radius. 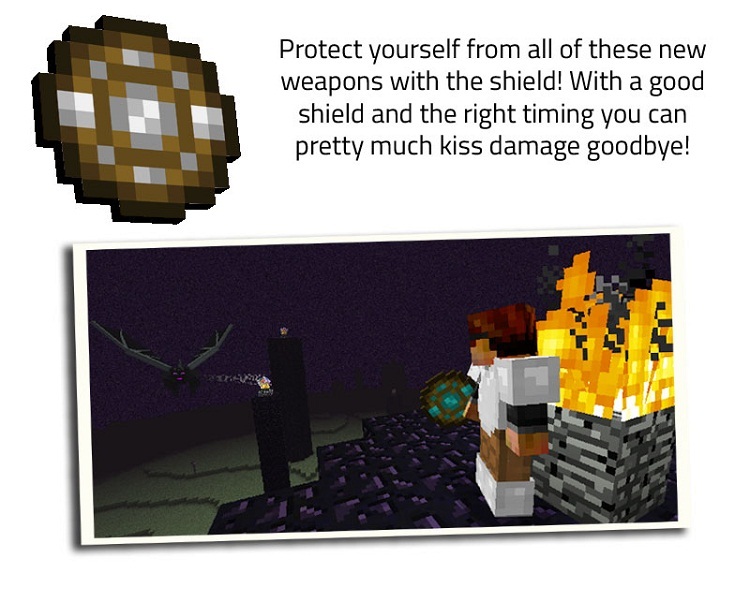 If an evil mob has this potion effect applied to them it will burn any and all mobs in a 4 block radius so make sure no baddies get their hands on this one! 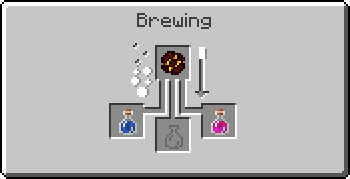 This potion is also the only way to burn ender men. 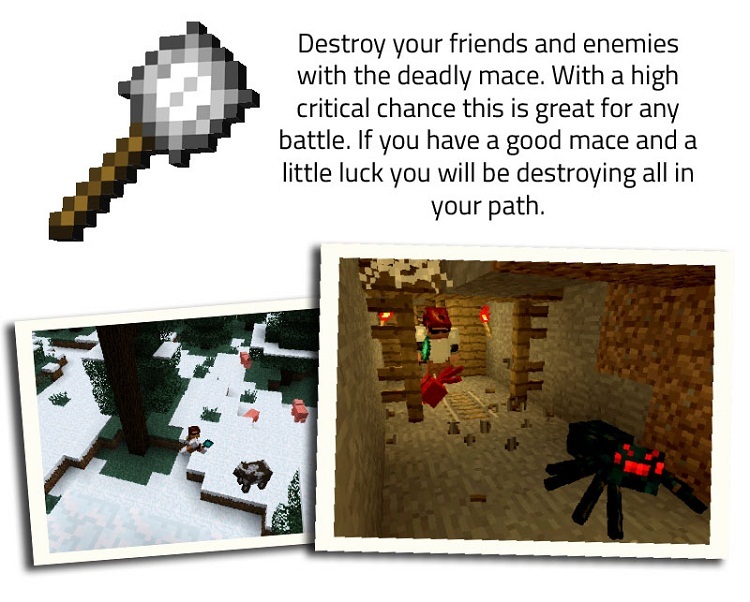 When you apply this potion to yourself or any other mob you will get some awesome buffs for about thirty seconds! Including resistance, fire resistance, and a small slowness debuff. Useful if you are in a tricky situation. The CureThe cure is currently a creative only potion that will remove all buffs when consumed. Similar to milk! The difference between milk and the cure though is that the cure has a splash potion. Useful for the new spiders that can spawn with buffs.